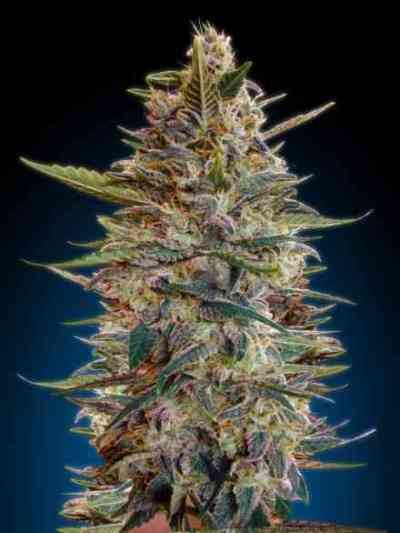 Serious Seeds White Russian #1 Auto marijuana seeds are not perfect yet, the quality of the final product may surprise you. A quite uniform final heigth of 70 to 90 cm is normal, but factors like the strength of light a plant receives, or growing in small pots can influence the height a lot. Autoflowering White Russian #1 is not 100% uniform yet. The more light they receive during their life, the better the endresult will be. All plants will be beautifully covered in a layer of trichomes. Most plants will finish between 70-75 days while some need a little longer, up to 80 days. Outside in Holland during lasting periods of bad weather there was evidence the leaves of plants may show spots of powdery mildew when they are almost ready. This can lead to bud rot, especially if wet conditions maintain. It is a good idea to check them daily under these conditions. If during rainy weather harvest time approaches; check for signs of fungus and cut them rather early than late. Serious Seeds hope to improve this variety even more over time, but the taste and potency of Autoflowering White Russian #1 is so satisfactory that they decided to put it on the Serious' menu.